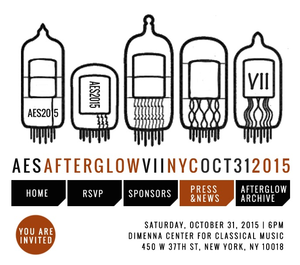 AES New York 2015 » Press Release: 139th International Audio Engineering Society's AES Member/Afterglow Party Set for Halloween Night, October 31 — All AES Members Welcome! You’re invited! Presented by the AES and Vintage King Audio, Afterglow is the premier recording industry AES convention party. This year it promises to be the biggest and best ever, with a special twist – it takes place on Halloween night, October 31! Now in its lucky seventh year, Afterglow VII will be held from 6:00 to 10:00 pm at the DiMenna Center for Classical Music, less than a half-mile from the 139th AES Convention at the Jacob Javits Center. With Afterglow landing on October 31, it seems only proper that it will be a masquerade-themed event drawing influences from the golden age of recording and the Motown movement. Everyone is encouraged to dress in black and white and masquerade masks will be given out at the door. Built in 2011, the DiMenna Center is New York City’s only acoustically optimized rehearsal and state-of-the-art recording space dedicated to classical music. With its warm beauty and innovative design, the DiMenna Center is the ideal site to host Afterglow VII. All current AES members can RSVP for Afterglow VII at http://aesafterglow.org/rsvp.html. Authorized wrist-bands for admission to Afterglow VII can be picked up at the AES Membership Center located at the Javits Center during convention hours. More information is available at http://aesafterglow.org. Other Afterglow VII sponsors include Gearslutz.com, Focal Press, AVID, The Recording Connection, Barefoot Sound, AMS Neve, Focusrite, Genelec, Slate Digital, Sonic Scoop, Audiomix, Routledge, and ADX by Audionamix. Get ready for a night full of music, complimentary cocktails and hors d’oeuvres in celebration of the 139th AES Convention - pro audio’s biggest event that brings together music’s top producers and engineers from around the world. For the latest information on the AES 139 Convention in New York City, and how to register for your Exhibits-Plus or premium All Access badge, visit http://www.aes.org/events/139/.